The use of medical marijuana is a controversial subject with it being legal in some states in America while not allowed in others. Currently there is a great deal of interest in the topic, which has resulted in the release of a variety of books designed to guide readers in food preparation techniques incorporating marijuana as a key ingredient. One of these recent additions is Aunt Sandy’s Medical Marijuana Cookbook, created by cooking instructor Sandy Moriarty, who is also a professor at Oaksterdam University. This book offers a collection of classic comfort food recipes for those who have been prescribed marijuana for medical use. This cookbook provides choices for those who want to cook with medical marijuana. Most of the medical marijuana recipes are traditional favorites such as mac and cheese, buffalo wings and oatmeal cookies. There are also low-calorie, vegetarian, vegan, sugar-free and gluten-free options. Moriarty instructs readers how it is possible to control the medicinal potency of the medical marijuana recipes by adjusting the amount of plant material that is added to the butter, oil or tincture components, or by varying the serving size. This allows each individual to customize the recipes to suit their unique needs. The book is divided into sections with recipes for desserts, sauces, dressings and dips, starters and soups, main dishes, sides and tasty snacks. In addition to the medical marijuana recipes there is information on the use of marijuana as medicine, how to inspect marijuana for the presence of mold, mildew and pathogens and information on general cooking safety. Cake, cookies, salad, vegetables, pork, chicken, turkey, seafood, cheese, pasta, rice, potato, bread, popcorn, chickpeas, nuts, coconut, raisins. 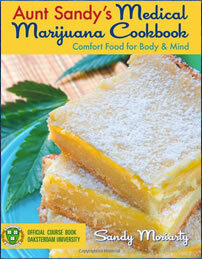 This book contains medical marijuana recipes and does not include any exercise recommendations. Aunt Sandy’s Medical Marijuana Cookbook: Comfort Food for Mind and Body retails at $18.95. Click here to purchase the book at a discounted price. Provides unique information about the use of medical marijuana recipes. Offers an alternative method of administration for those who have been prescribed medical marijuana. Explains how to adjust the dosage to suit each individual. Written by a professional cooking instructor. Includes low-calorie, vegan, diabetic and gluten-free options. Only applies to people who use medical marijuana. Does not provide nutritional information. Many of the medical marijuana recipes contain unhealthy ingredients such as white sugar, white flour and butter. The author is not a qualified health professional. Some may contend that the book encourages the use of illegal marijuana. Aunt Sandy’s Medical Marijuana Cookbook provides instruction in cooking techniques and recipes incorporating medical marijuana. Unfortunately many of the medical marijuana recipes, especially the desserts, contain high amounts of unhealthy ingredients such as butter, sugar and cheese. These foods will be counterproductive for those using medical marijuana for alleviation of symptoms related to health issues such as depression or disorders involving imbalanced immune function such as cancer.